Shanuk is a one and one-half year old Siberian with a contagious smile for everyone. This blue eyed pup came into rescue when his family had to move and could not take him with them. 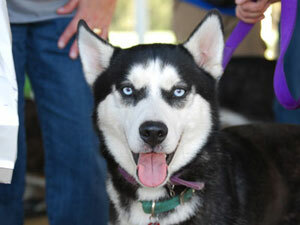 Shanuk is a typical young husky with lots of energy and curiosity. He is a happy-go-lucky boy that is looking for an active home with other canine playmates and a good sturdy fenced yard to run and tumble in. This pup needs outlets for his energy that will keep him from becoming bored and getting into too much puppy mischief. Shanuk is going to become a wonderful companion for a dog savvy person that is ready and able to commit to the training and lifetime care of a new best friend forever.